As part of the 2015 POPSUGAR Insights Food study, we surveyed female visitors to POPSUGAR to better understand their grocery-shopping behaviors. 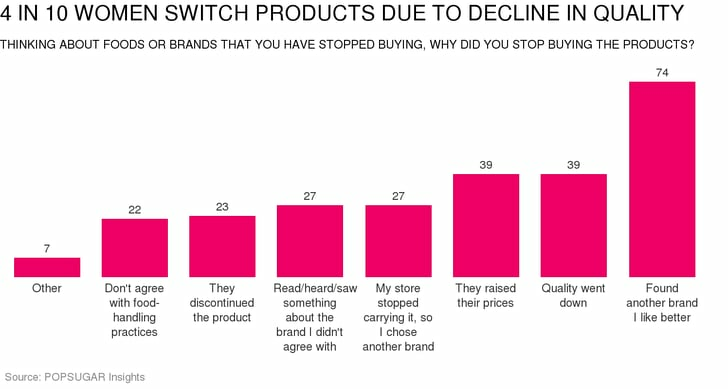 We were keenly interested in learning more about food-brand-decision drivers, so we asked women to tell us more about food brands that they have stopped purchasing and to share the reasons why they decided to stop purchasing a one-time favorite. Overall, 74% of women said that they "found another brand that they like better," proving that a consumer's taste can be fickle in certain cases. Nearly 4 in 10 women said that they chose a new brand because the quality of the brand they had been purchasing went down or that the brand raised its prices. Twenty-seven percent said that they chose another brand once their grocery store stopped carrying their current brand and 27% of women said they had read or seen something in the media about the brand that they disagreed with. There are many reasons why a woman might stop purchasing a particular product, and these moments represent a keen opportunity for competitive food brands to address a woman's needs, educate them about their own product benefits, and provide them with a quality product.